Kimbra Iridescent | The Ego Co.
A new event brought to you by The Ego Co., Around the World begins November 15th. Participating designers will bring you a taste of their selected region of the world. FAKE will be offering this fabulous skin available in 2 tones and 6 different versions. Today I opted for the basic clean version. The full mesh outfit I’m wearing is designed by 22769 and will be available at the event as well. I have to say the headwrap is my favorite. For more information on Around the World and to check out more preview items, go to The Ego Co. Tagged !bang, 22769, Around The World, FAKE, Izzie's, JesyLiLO, MG, The Ego Co.
Are You Ready For The Costume Ball? The Ego Co. had been working hard to bring you another fabulous event. The Costume Ball begins today at noon SLT and runs through November 1st. Designers have created unique items exclusive to the event fitting the them “dark, but with class”. I’ve got a few things to show you before the fun begins. Once the event does begin, I’ll have a landmark to share. My favorite part of Autumn begins when the leaves start to change color and fall from their branches. The Summer Harvest Hunt continues to get me excited for those cool breezes and blissful nights. I can tell you for sure this hunt is one worth doing, not only are you going to find some fabulous seasonal clothing and accessories but also lovely and very detailed decor, perfect for your SL home. The Hunt begins September 1st at Noon SLT. If you’d like to see more of what this hunt has to offer, you should also take a peek at The Ego Co. blog. The Summer Harvest Hunt is about to begin, September 1st to be exact. The hunt theme is late summer/early fall and will last 3 weeks. Over the next few days I’ll be showing you some of the wonderful goodies in store for you. First of all, this pose prop from Bent really got me in the autumn mood which is quite surprising seeing as it’s still close to 100 degrees where I live. The prop includes 6 adjustable poses and is a free gift for the event! I took a few different shots but this my favorite of them all. Secondly, SAKIDE will be gifting you this mesh outfit. The set includes a mesh bikini, pants and a wrap top in both white and beige. For more preview photos head to The Ego Co. 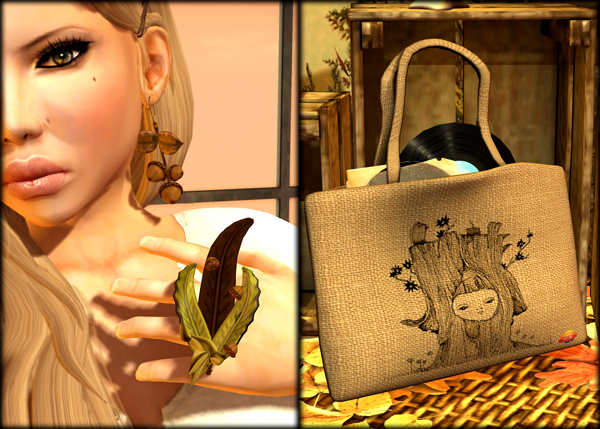 Tagged *League*, BENT, Izzie's, magika, Sakide, SLink, Summer Harvest Hunt, The Ego Co.
Ego Co. Bloggers, Fluid, Kimbra Iridescent, The Ego. Co.
Fluid’s back with a new rotation and this time around the overall theme is Athletics. I thought I’d break out some b-ball with my boy and see if I could beat him. Unfortunately for me he’s definitely got some height advantage but I tried my hardest! The first pose set we’re using is from Y’s Art&Poses. Included are a set of poseballs along with individual animations for the pose and a basketball prop. Our second photo is a set from *Art Dummy! which includes a sink with 4 adjustable animated poses, a medicine cabinet, a towel and basketball prop. If you’re looking to keep your prims down a bit there’s a non-animated sink as well. This set is 12 prims with the animated sink and 7 prims non-animated. Fluid’s Athletics session will be running through July 31st and also includes the themes Cheerleading, Football and/or Soccer. Keep reading for landmarks! I’m enjoying watching Summer take hold and being able to throw on a cute and totally comfy sun dress for the day. When I saw these dresses created by Maya Levane of Toki-Doki and Irie Campese of So Many Styles I had to have one. I decided on this lovely yellow floral one that reminds me of my favorite summer dress in RL. Several prints are available and can be purchased in either shop! Another one of my favorites is from J’s, yay for new mesh flip flops! They come with two huds, one for nail color and one for resize/skin tone. Also, there’s 3 flower attachments that can be worn together or individually. For my last note of the day, Mesh Around is almost over so I thought I’d show you a few more things you may not have picked up yet. There’s still two more days to grab some wonderful hunt gifts! Hello boys and girls, I missed you! I had a wonderful vacation, exactly what I needed but I’m glad to be home. I realized while I was gone the many things I couldn’t possibly live without… a relaxing place to sip my coffee in the morning, a good book, my phone and for when I’m on the go, a huge bag that’s able to fit just about anything. Today, I decided to show you quite a bit more Mesh Around. If you haven’t yet started this hunt you still have plenty of time since it continues through June 15th. Some other newness I’m thrilled with is this adorable skin from Modish available at the Color Blocking Fair, the lipstick options are endless! To complete my look I had to run and grab the free subscribo cell phone poses from Label Motion and this oversized shoulder bag from Severed Garden available at ZP Brand.